The blends below have been specially selected to assist your therapeutic treatments for the effects of daily stress, anxiety and the pressures of modern living. 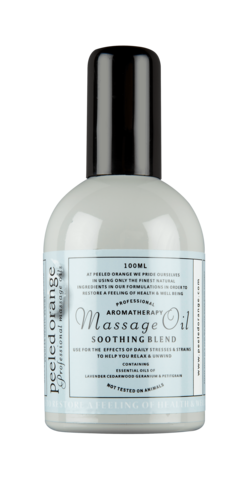 Soothing Blend by Peeled Orange contains carefully selected Herbal Oils including Lavender, Cedar Wood and Petitgrain. This Intoxicating and Euphoric Elixir, will soothe your mind and spirit, easing away the cares and worries of the day. By relaxing the mind and spirit, we also relax the body. 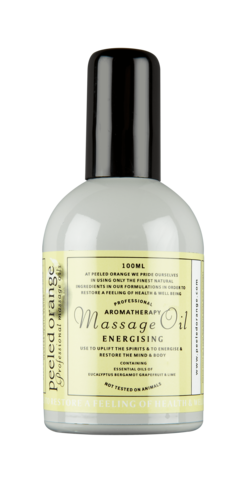 Peeled Orange Soothing Massage Oil will assist any Therapeutic treatment to ease and relax a tired mind and body. Read more about the Soothing blend or place an order here. Read more about the Energising blend or place an order here.